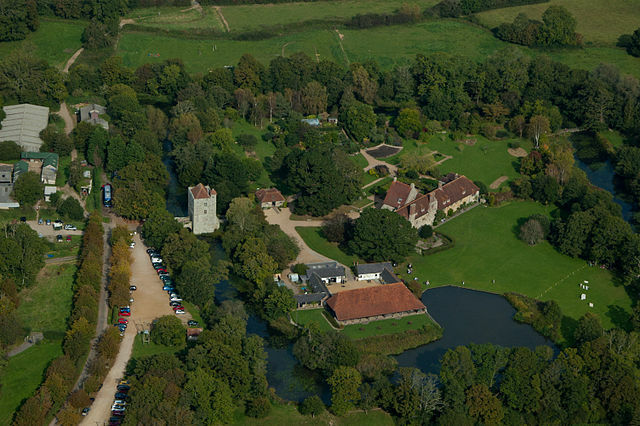 Michelham Priory and Barbican Tower. By Barbara van Cleve (Own work) [CC BY-SA 3.0 (http://creativecommons.org/licenses/by-sa/3.0 )], via Wikimedia Commons. An amazing venue with lots of history. 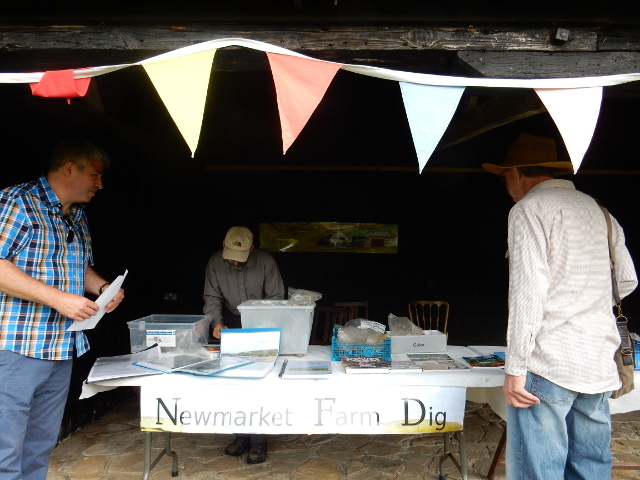 Newmarket Farm Dig Stall, Michelham Priory WW2 Event. 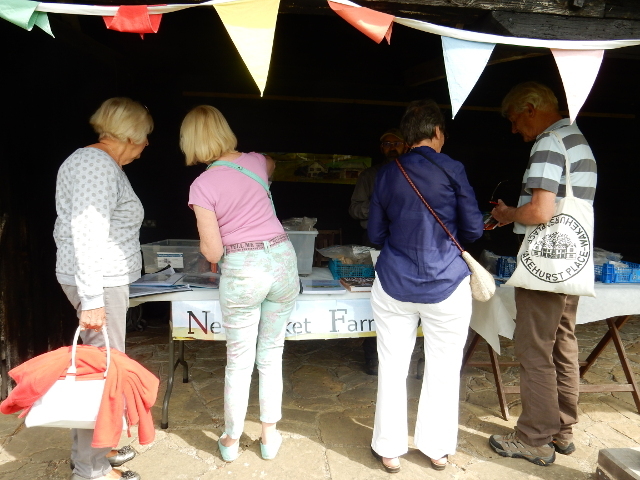 The photograph above shows me, head down, working on getting our stand ready at the WW2 Event at Michelham Priory. Little did I know how successful the day would be! The event was bitter-sweet for me. The Second World War saw the destruction of the Newmarket Farm cottage and barns. Also, I do not enjoy military hardware. Nevertheless, whether I like it or not, the Newmarket Farm cottage – where my mother’s family lived for four years until 1942 – as well as its surrounding downland, including the Balsdean farm for which they worked, all became part of the No. 3 Newmarket Military Training Area. I have chosen to research its history, including the sad bits. Screw picket for barbed wire; 13th December 2013. Western Cartridge Corporation .45 Automatic Colt Pistol cartridge ; 13th December 2013. Screw threaded base of a 36M Mills Bomb; 22nd November 2013. One of two finds trays from just S of S extension of cottage; 20th October 2013. Headstamp of .303 tracer bullet; 11th October 2013. Probable military WW2 finds of unknown function; 6th October 2013. .303 cartridge; 16th August 2013. No. 36M Mills bomb base; 26th July 2013. .303 cartridge from under corrugated iron sheet; 16th June 2013. .303 cartridge in trench 2 over water-pipe in farmyard; 19th May 2013. Writing on headstamp just about fully revealed; red paint just about lost; 21st March 2013. Rosette crimped blank .303 cartridge, made by The Royal Laboratory, Woolwich Arsenal, 1893-1904. Evidence of the Newmarket Farm’s use for military training purposes was abundant in our excavation. 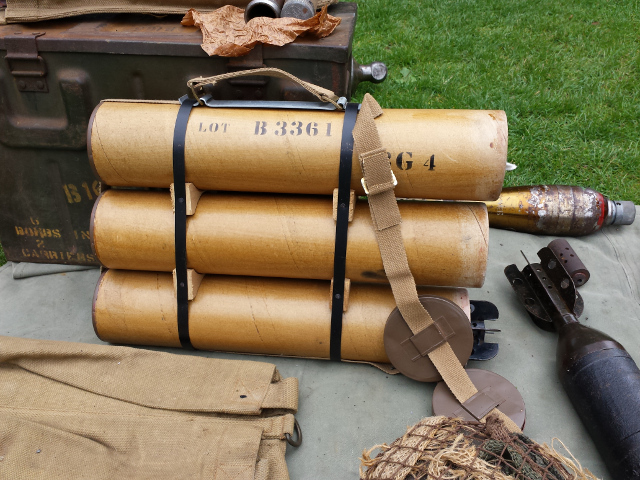 The Michelham Priory WW2 event was thus a superb opportunity for me to learn from military experts about what we found, and how it may fit into a bigger picture of things. 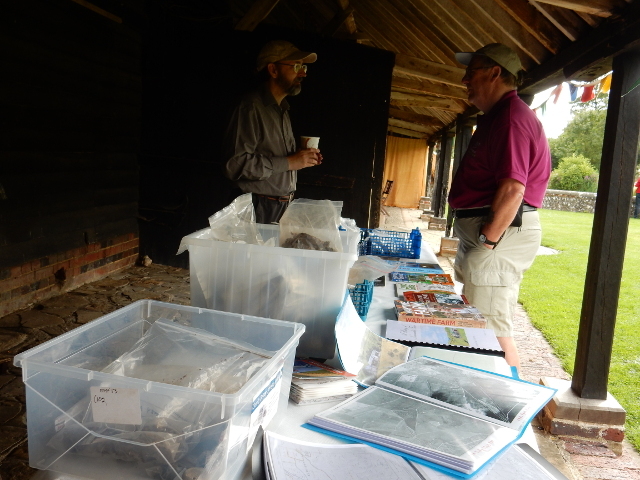 Above are shown some photos of just a small part of our finds, most of which I brought along to the event. 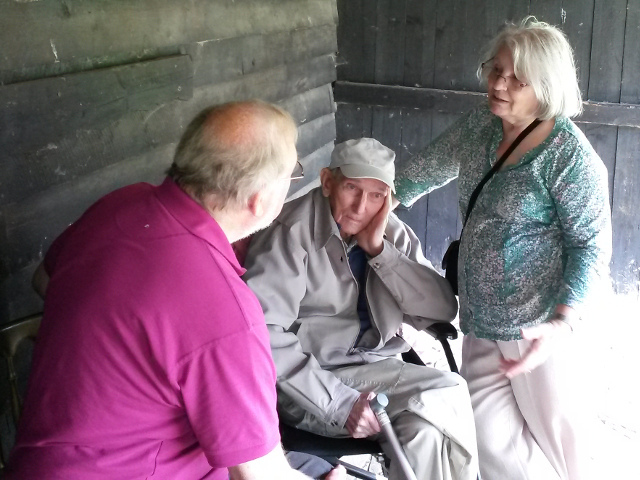 Fortunately, because the day was pretty full on for me, I had the support of another David, as well my mother – though she was kept pretty busy pushing my elderly dad around in a wheelchair kindly lent by Michelham Priory. They were both especially useful photographing some before and after pictures of our excavated, fired ordnance, whilst I looked after our stand and talking to interested visitors. The finds that gained the most interest from the experts were the detonated remains of a PIAT (Projector, Infantry, Anti-Tank) projectile (“bomb”). Three or four were excavated from amongst, or under the demolition rubble of the cottage, but the one shown in the above photo was the most complete. It was originally designed to be an anti-tank weapon, and was brought into action in 1943. Some research on the Internet has given me some more information on the workings and use of this challenging weapon. 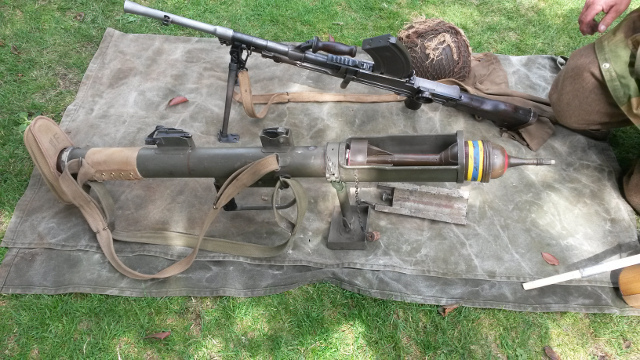 A sergeant approached Pat and asked him what he could do with his PIAT. `I can blow the wall up,’ said Pat. Such would have been Newmarket Farm after being on the receiving end of this weapon. Geoff Wicks, shown in the photos above, was pleased to show me the gun which fired the PIAT bombs. He told me what a challenge it was both to load and to fire. I have read that anyone who used it in action deserved a medal, particularly because of its bad recoil – despite having been designed as a recoilless weapon. Apparently it was favoured by Canadian infantry. The son of the Rottingdean based police constable of the time has told me that soldiers of the Canadian Princess Patricia Light Infantry Regiment were based in the area. He reported that they had the wide triangular shoulders typical of lumberjacks – ideal individuals to use and carry such a heavy weapon. The practice with this weapon against the Newmarket Farm would have been of great benefit for those who would have had to use it in a live fire situation. It is worth noting that further down the valley towards the former hamlet of Balsdean, was a figure of eight light railway which would have been used for anti-tank training. It was well known to the children of nearby Woodingdean, who regularly snuck into the training area during the war looking for souvenirs. Also new for me was to see the original of our recently identified No. 69 (Bakelite plastic) grenade fragments. 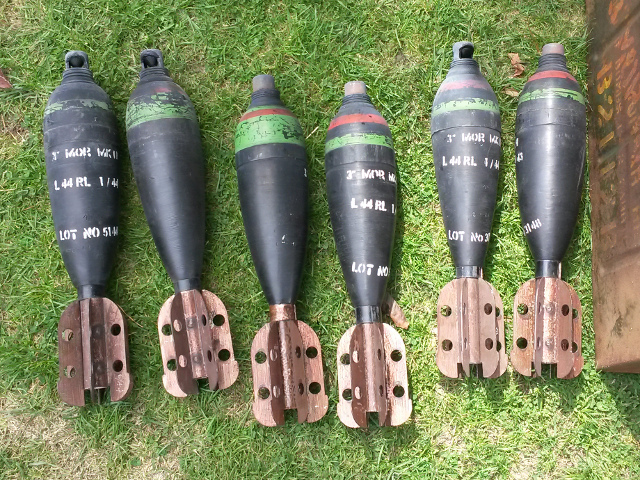 Our remains, which resembled screw threaded bulb fittings for a table lamp, were the top part of these grenades. The body shell, which would have held the high explosive charge, would have shattered on impact and as yet no such fragments have been identified from amongst our finds. 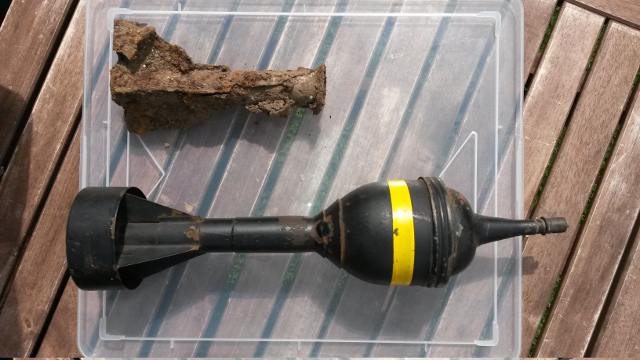 Also yet to be identified from our finds were the firing pins and the ball bearings that were attached to either end of a tape which unravelled in flight and that thus automatically primed the grenade whilst it was in flight. The tape was almost certainly of cotton and would have rotted away. Apparently they were very good at producing a bang and a flash, and so were commonly used in training exercises. However, if the thrower was unlucky, the ball bearing could be blown back in their face causing them significant damage. I found a YouTube video which gives some helpful information about their use and construction. 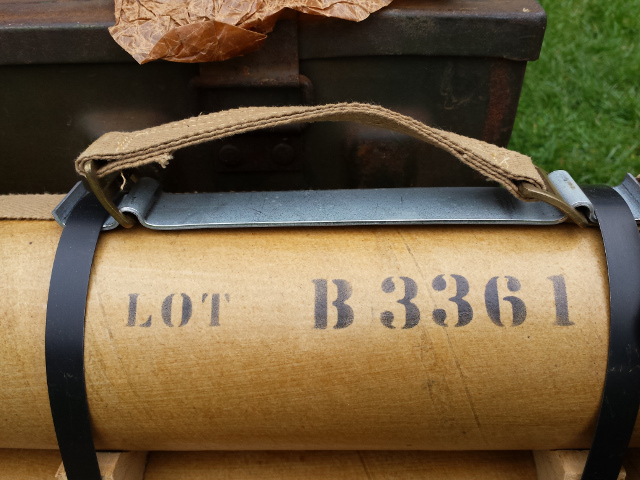 Replica 3″ Mortar Carrying Case. Replica 3″ Mortar Carrying Handle. 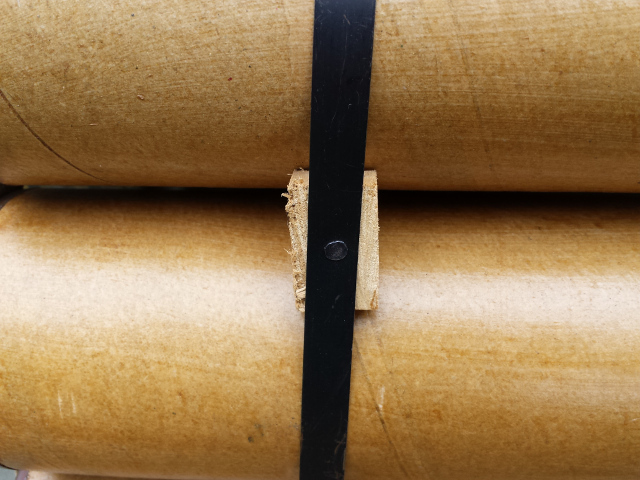 Replica 3″ Mortar Metal Strap with Tin Tack. 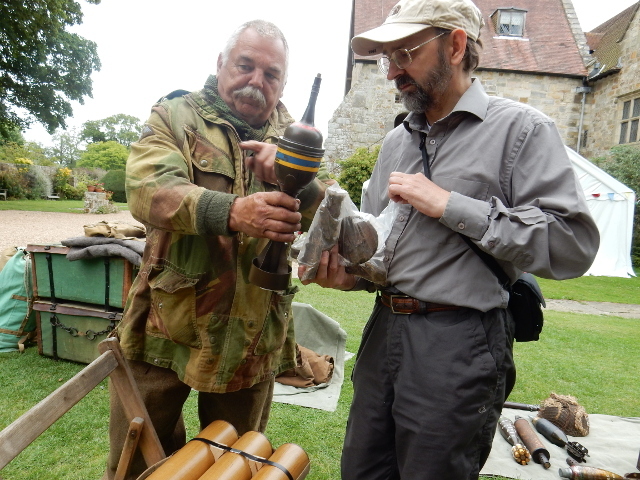 Geoff Wicks was also displaying his replica 3″ mortar carrying cases. We had excavated a large stash of lids, carrying handles, metal strapping and tacks, which pretty much matched his replica. The stash was associated with a discrete area of burning against a recess in the east wall of the cottage, facing the head of the Newmarket Bottom. Also found were what we called ‘bicycle bells‘; circular shallow bell-shaped (lids?) each with 3 widely spaced rivet strengthened holes about the diameter of a shoe lace hole. 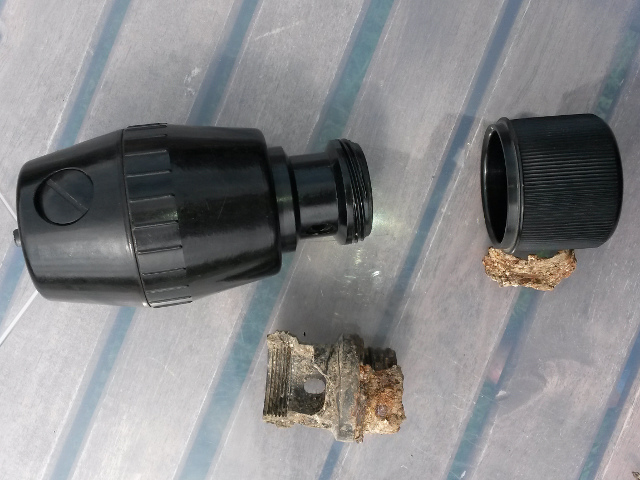 I have speculated that they may have fitted inside the ends of mortar carrying tubes. Evidence for this possibility was that they were a perfect fit around the curved ends of the 3″ mortar fins. However, none of the military experts at the event had seen them before, and I have yet to find any illustrated on the Internet. Further research is needed. I have yet to record them in detail; to measure their dimensions, and to count their numbers – especially in relation to all the other related items from the excavated deposit – I believe we found just about every item from this particular context. This information could then be forwarded to, perhaps, the Imperial War Museum for a formal identification. War Office 1″ O.S. Map 1941. War Office, 1″ O.S. Map 1941. 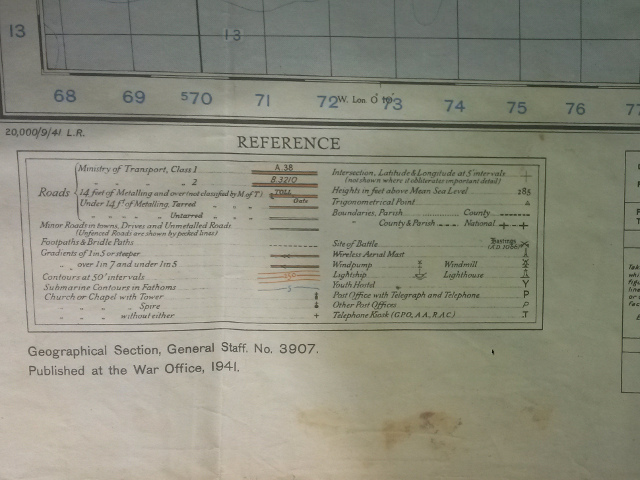 I was very pleased to see my first example of a War Office 1″ Ordnance Survey map (on a stall belonging to Newhaven Fort?). Even better that the sheet on display covered the South Downs between Brighton and Eastbourne, and clearly showed the Newmarket Farm! It may be important for my planned research on locating military training exercises. 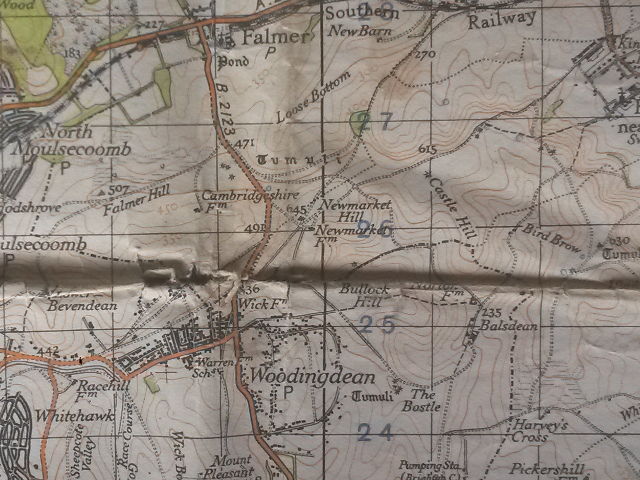 It clearly confirmed what I had previously learnt from Peter Hibbs’ excellent The Defence of East Sussex Project website – that the War Office used a 1km grid system with a different orientation to that used on modern O.S. maps. 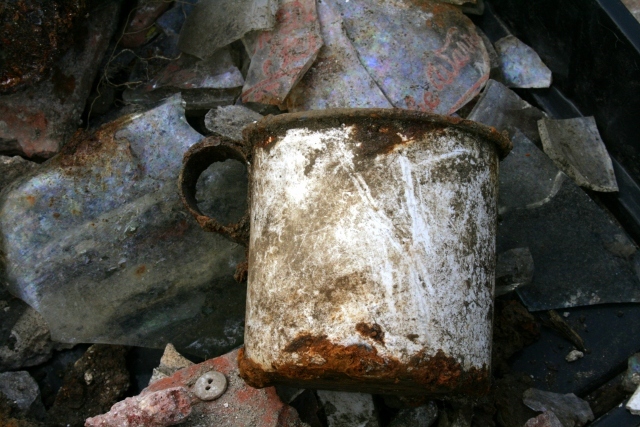 We had excavated a white enamel mug from inside a ceramic drain in front of the cottage. 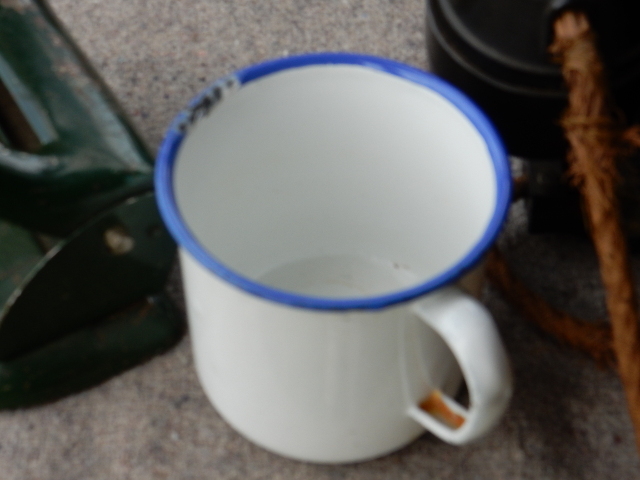 It was found along with an enamel saucepan handle, a bottle of OXO, and a rusty food can (empty); all possible remains of a camp meal. I had speculated whether the cup might be of military issue. I was wrong! Army issue cups were not only larger, they were an essential part of their kit, and if lost or damaged there would have to be a very good reason for it, or the culprit certainly be put on punishment duty. 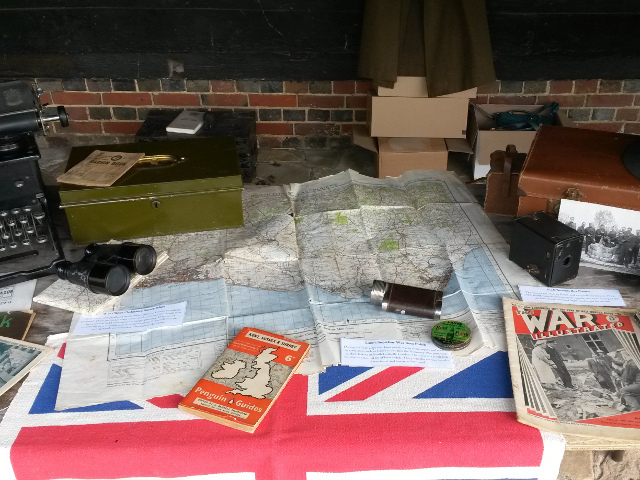 Visitors to stall at Michelham WW2 Event. It never ceases to amaze me the interest shown by people about the project. Apart from a large part of our military related finds, books and documents, I also brought along some of our many other materials that related to life on the home front. I am glad I did. A wide variety of people with different interests and backgrounds, including children, came to visit the stall. I just wish I could remember their names, as well as the names of the organisations many of the interested stallholders were from! A big thank you to them all – for the interest and information I received. My parents with Mr Edwards. 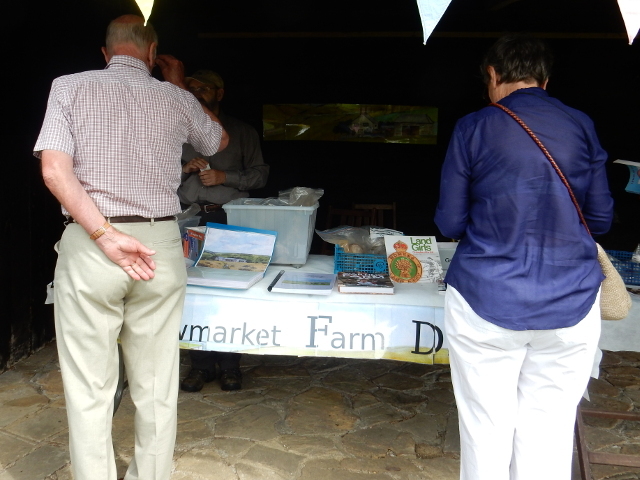 A Mr Edwards visited the stall, and had a chat with both myself and my parents. He was the nephew of one of three brothers I had recently researched. They each worked one of three adjacent smallholdings collectively called Brownloaf Farm. It was situated on the steep hillside between Woodingdean and Bevendean, not far from Upper Bevendean Farm. My mother’s cousin now rents the farm from the Wests (of Bevendean Farm) for the grazing of a considerable number of horses and ponies. My father used used to fix at least one of the brother’s tractors. As a teenager I knew him just as ‘Eds’. I was able to tell Mr Edwards the little of what I had learnt of them from when I was researching the Edwardian origins of both Woodingdean and WW1. Unfortunately I either didn’t receive, or mislaid Mr Edwards’ contact details, for I would be happy to pass on copies of my research documents, including some copies of the 1942 agricultural surveys of the 3 Brownloaf Farms. 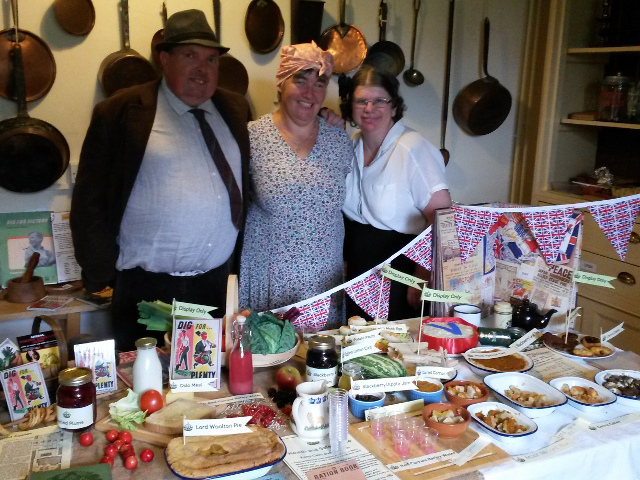 I was so busy with my own stall I sadly didn’t manage to visit many of the other excellent stalls, including this one informing visitors about life on the ‘Home Front’. 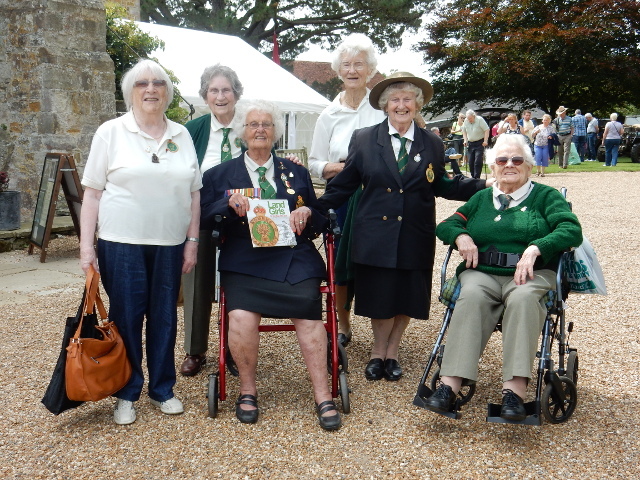 Five Land Girls and a Lumber Jill (right to left). My mother was fortunate to meet these amazing ladies. I had recently been told that the hard-working women of the Land Army were regularly seen in the rapidly developing village of Woodingdean. Trained at Plumpton Agricultural College, they took on much of the valuable work which helped feed the nation during this time of crisis. They cultivated the many acres of vacant plots of land requisitioned by the East Sussex War Agricultural Committee. They also took over the running of Woodingdean’s Wick Farm (to the north-east of the Downs Hotel crossroads). It was the last remnant of entrepreneur Oscar Selbach’s acquisition of the Balsdean, Norton farms, and of the far western end of the Kingston Farm, which included the labourer’s cottage and barns of Newmarket Farm. The greater part of his farmland – that situated in the Balsdean Valley watershed – had been compulsorily purchased from him by Brighton Corporation in 1925. He didn’t have a good reputation in the village, and has been widely reported as having been an arrogant man. However one can only imagine what it must have been like for him to have his last remaining remnant of farmland – on which he kept a small dairy herd – confiscated by the East Sussex War Agricultural Committee after it failed its assessment in 1942. He had allowed his pastures to get into an extremely poor condition. Though he was not the only farmer in the area to have the management of his farm taken out of his hands for the duration of the war – the farmer at Lower Bevendean lost his – but he was the only one that I have read of in the area to have had it managed by women. Judging from the ‘land girls’ in the photo above, I reckon they could have easily taken on his farm and have left it in a better condition than that which they had started with. Peter Hibbs, who I met at the Michelham Priory event, has kindly sent me copies of compensation documents for the South Down farmers who lost all or part of their land during the war. Oscar Selbach, for the first time in any of his many documented dealings with officialdom, only submitted a modest claim.